The Apostol festivities in Santiago de Compostela have finished, but now visitors can enjoy a wide range of lively celebrations few kilometers far from the capital of Galicia. This holiday month begins with special points as emblematic as the “XLIV Festa do Albariño“ in Cambados or “LVI Romaría Vikinga de Catoira” an International Tourist Interest festival. And the festivities also take place in big cities such as the “Maria Pita” celebrations in A Coruña or “A Peregrina “in Pontevedra. 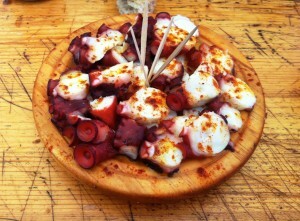 There are also gastronomic events so recognized as “A Festa do Pulpo no Carballiño” that has a great success among those who come to Galicia on these dates. And for the visitors who will spend this month in Compostela , they can enjoy a wide range of cultural like concerts of “Atardecer no Gaiás” at “La Ciudad de la Cultura” and the street festival “Feito a Man” that fill with music and theatre our town. These are just some proposals of the great variety of Galicia’s festivals.